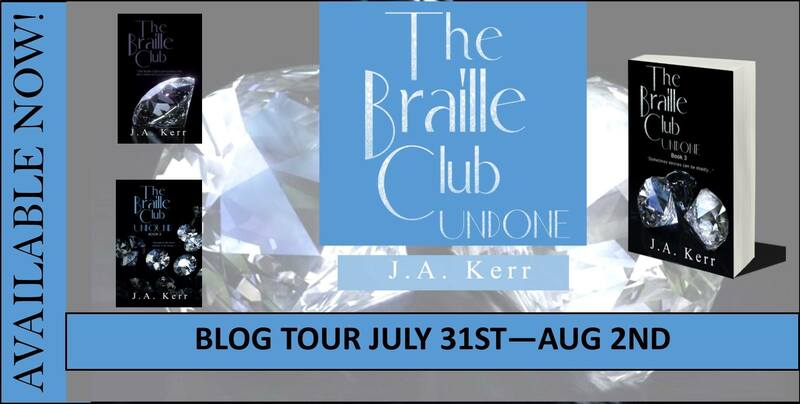 The Braille Club Undone is the third book in The Braille Club series and is AVAILABLE NOW! Five Star Review! As an avid follower of The Braille series, I couldn't wait to read the next instalment from J A Kerr. Book 3 doesn't disappoint! With increasingly complex storylines and clever introductions to fresh characters, you are taken on a roller coaster of a ride; experiencing contradictory emotions as the book gathers pace. Definitely darker than the first two books, Kerr manages to balance romance with danger, and offers the reader fascinating insight into "edgier" elements of sexual desire. Braille club die hards will enjoy the twists and turns of familiar relationships however "Undone" takes them to another level, setting up a tantalising finale that will keep you guessing! Great read, highly recommend! – Marie Lynch. I was born in the spring of 1967 at Paisley’s Ross Hospital in Scotland and grew up in Glasgow. I was an office administrator and latterly a recruitment consultant before marrying and relocating to The Netherlands with her husband. After two years, I moved to Cheshire where my first child was born and returned to work part-time. My final relocation took me back to my home town of Glasgow where I welcomed the arrival of my second child. I raised my family whilst harbouring dreams of becoming a writer. In September 2013, I took the plunge and started my first book. When I set out to write these books, I wanted to create something that mirrored exactly the kind of books I like to read. My top picks are always originals featuring strong male and female protagonists with attitude. The Braille Club Series books are a great mix of genres. Although sensuality plays a big part, there is also intrigue and a touch of thriller. I love to connect.